Congratulations from everyone at CTfC! Councillor Alexis Diouf became Chesterfield's 374th mayor at a ceremony at the Town Hall, Rose Hill today, Wednesday, 14th May. Pictured here with the Mayoress, Mrs Vickey-Anne Diouf and his Chaplain Simon Robinson with his wife, Hazel. Councillor Diouf has lived in Chesterfield since 1980, he was born and raised in Senegal, West Africa and was elected as Liberal Democrat councillor for Walton ward in 2003. Born in 1955, he recently retired as social services manager in Derbyshire County Council's adult social services department. He has also worked as a social worker at Walton Hospital, for the United Nations in Mali and for the charity, World Vision in Senegal. Councillor Diouf is a founder member of the Chesterfield African Caribbean Community Association and served on the YMCA board. He was also chair of Christian Action in Chesterfield, which runs a winter night shelter until January this year. 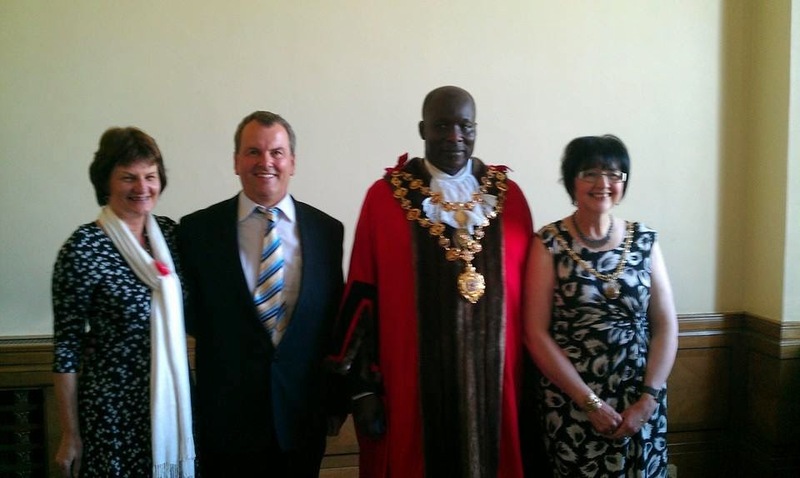 Councillor Diouf said: "I am honoured to become Mayor of Chesterfield. I have lived in the borough for over 30 years and look upon it as my home, although Senegal will always be close to my heart. "We are very much looking forward to meeting residents of the borough in the course of our Mayoral duties." Councillor Diouf's wife, Vickey-Anne, will serve as Mayoress. Mrs Diouf was born in Chesterfield and works as a primary school teacher. Both are committed Christians, attending Walton Evangelical Church. Friends of Baback in Chesterfield - a small charity sponsoring children from the primary school the mayor attended in Senegal. It also sends educational and medical equipment to village schools and dispensaries in Senegal.